A few summers ago, I whipped up a party-size batch of Watermelon Sangria. It was a hit and really made my croquet game better than ever! And summer is the time to enjoy juicy, sweet melons – the markets are brimming with them. With their crisp, cool and refreshing qualities, melons evoke the essence of the summer season. We enjoy them in a multitude of ways. From simple chilled watermelon wedges with a sprinkling of chili lime salt to colorful melon-ball skewers of honeydew and cantaloupe intertwined with thinly sliced prosciutto for utensil-free outdoor snacking! 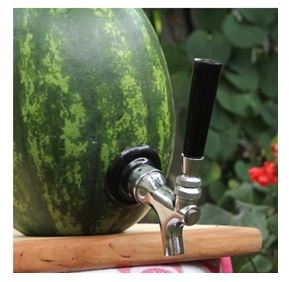 And have you ever seen those “watermelon taps?” They’re super cool to add in a watermelon drink and have it ready to pour. 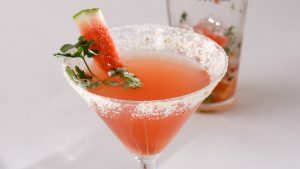 But one of my favorite watermelon cocktails is the “Smitten:” tequila, fresh watermelon chunks, lime, a little simple syrup, a few sprigs of cilantro and a dash of hot sauce – it’s something a little different and d’lish! 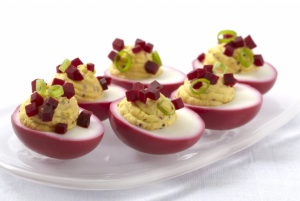 Check out www.LiquidKitchen.tv to get the recipe and watch a video on how to make the Smitten! Nightclub & Bar posted an article on Infused Ice, a great way of adding another layer of flavor to any cocktail. Make sure to check out the article for tips and recipes like my Angostura Infused Ice Balls, Bubbles in the Garden punch cocktail, and a Watermelon Rickey. If you are like me you have a plethora of herbs filling your summer garden. Of course, we all know that you can cook with them, but have you thought about sipping with them too? I am not just talking about the mint that grows like a weed and spreads across your garden. There are other herbs and even edible flowers that are super delicious and beautiful to add to your cocktail creations. Fresh sage for instance is amazing paired with tequila; try it in my Sunset Sage Margarita recipe. Summertime is the perfect time to sip on a Collins. Combine vodka, fresh lemon and local honey syrup with a few sprigs of fresh thyme. Shake it up and finish with a splash of soda. If your backyard is brimming with berries, shake in a few of those too! And I’m a big fan of fresh rosemary in cocktails. For an herbal gin & tonic, add in a sprig of rosemary with a squeeze of orange. 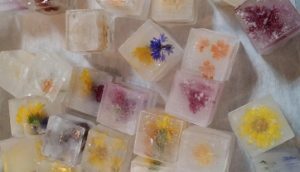 Another fun idea is freezing herbs and edible flowers in ice cubes! Pick up some silicone large-format ice cube trays. Fill them half way with water and then pop in the freezer for 45 minutes to “lightly set”. Now, add in all kinds of herbs and edible flowers. I personally love to put thyme with my pansies, or sage with rose petals, then fill with water and freeze again. Great to add to any summer style cocktail. Tear the sage leaf and drop into a cocktail shaker. Fill the shaker with ice, then measure in the remaining ingredients. 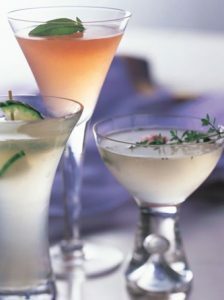 Cap and shake vigorously until very cold.Strain into a chilled cocktail glass or serve over ice. Garnish with a sage leaf.